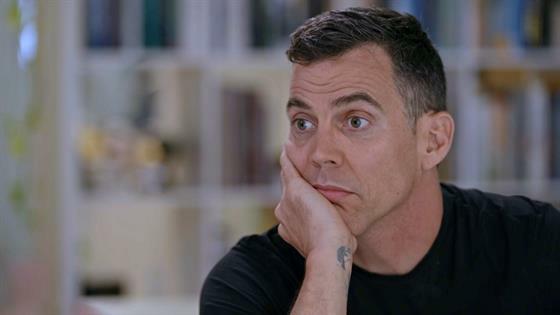 Steve-O's mom passed away almost two decades ago, but the wrongs she endured toward the end of her life still haunt him today. In this clip from Thursday's season finale of Hollywood Medium With Tyler Henry, the clairvoyant connects with the reality TV veteran's late mother and manages to deliver a spot-on reading that shocks, intrigues and overwhelms his guest all at once. "I'm trying to figure out what this is," says Tyler Henry, who's scribbling in his notepad while Dr. Drew Pinsky and neuro specialist Dr. Andrew Hill observe his brain function (he's wearing a cap covered in sensors that work to produce a visual "brain map" with the data it collects) on a monitor nearby. Steve's reading actually takes place inside L.A.'s Peak Brain Institute, where the doctors have endeavored to observe what's going on in Tyler's mind—from a scientific standpoint—when he communicates with the other side. From the other room, Dr. Drew notes a change in the brain scan. "What's going on there?" he asks his colleague, who, despite his superior medical qualifications, seems to be at a bit of a loss. "It's not a wave complex I'm used to seeing," Dr. Hill replies. From there, Tyler's connection with Steve's mom becomes clearer and clearer. As he's acknowledging references to a "decline" in her quality of life tied to a critical incident that happened before she actually passed and left her dangerously alone, the former Jackass star is visibly upset by the memory. "The point of decline was five years before mom died," he says, explaining that his mother suffered an aneurism in the fall of 1998 and didn't receive immediate care because her then-partner "just failed to call for an ambulance" in a timely manner, leaving her "physically and mentally disabled" for the last years of her life and often alone, too. "That pain that she was in…I still can't really handle that very well," Steve admits. "I have a lot of personal trauma over the pain and suffering that my mom went through."